Port Renfrew is only a two hour scenic drive from Victoria. Lots of activities are readily accessible for the avid eco-tourist, as well as to those just wanting a quiet, beautiful place to relax and take it all in. Two to four days is ideal for exploring the area. Whether you want to hike for a week, a day, or an hour, there is a trail for you. Choose from a variety of well marked and maintained hiking trails, including the world renowned West Coast Trail and Juan De Fuca Marine Trail, as well as short day trails that take you along the beach, beside rivers and waterfalls or through old growth forest. See the Red Creek Fir, the world's largest Douglas Fir tree at over 240 ft. tall and estimated to be 700 to 1000 yrs old. Visit Botanical Beach with its' rich tidal pool marine life and beautiful coastal forest walk. Adventure sports abound. Kayak or Canoe the rivers, inlet and ocean. Surf, mountain bike or go on a marine eco-tour for whales, porpoise, sea lions and much more. Click here for more information about the Pacific Marine Circle Route linking all of the South Island. Gorgeous sandy beaches, fresh water lakes, & great wildlife viewing all await you, and more! BOTANICAL BEACH - a world renowned protected reserve of stunning tide pools containing a vast variety of colorful shellfish & sea flora. Awe inspiring storm watching and unique forest walks make this one of the most amazing places on the West Coast. RED CREEK FIR - The largest Fir Tree in Canada towering to a height of 73.8m (242'), a circumference of 12.55m (41'2"), it's crown is 22.9m (75') and is estimated to be between 750 to 1000 yrs old. A true giant! Soule Creek Lodge has detailed driving instructions to the Red Creek Fir and San Juan Spruce (second largest Spruce tree in the world) available to its guests with an SUV or 4X4. WEST COAST TRAIL - Open May 1st through the end of September, this trail is rated one of the top three trails in the world. At 75km, this trail is not for the faint of heart. The trail was originally constructed for ship wreck survivors in the early 1900's after a national tragedy. The trail stretches from Port Renfrew to Bamfield and offers some of the best old growth in B.C. JUAN DE FUCA MARINE TRAIL - A recently opened trail spanning 47 km from China Beach (just north of Jordan River) to Botanical Beach in Port Renfrew. Four trail heads allow for easy access, for those wishing to do only shorter sections or day hikes. Next to Botanical Beach, Sombrio Beach provides the easiest access to the ocean and is a great stop either coming from Victoria or when leaving towards it. A warning about the road getting down to the parking: it is gravel and not well kept. Also, you will see a sign indicating "Sombrio 400 Meters". This is the last posted sign, and there are none at the turn off, so keep an eye on your odometer. AVATAR GROVE - Consists of an Upper and Lower Grove. 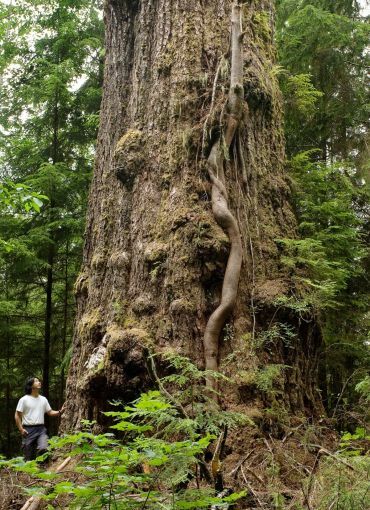 The Upper Grove is home to Canada's Gnarliest Tree: a giant Old Growth Cedar with a 14 ft. diameter burl. Many other large Old Growth trees can be found here. The Lower Grove has many more large Old Growth trees, and one can find a rugged path to the Gordon River. Avatar Grove is about 20/30 minutes drive from Port Renfrew, and directions can be obtained at the Lodge. This area is not an official park or recreation site, so the trail is not easily accessible for those with small children or those with mobility issues. HIKING THROUGH HISTORY - Too many to list here. Trails vary in length (30 min to all day) and difficulty (easy to strenuous). Hike through old growth, coastal rain forest, along serene rivers, waterfalls and much more. Great opportunities for wildlife sightings. WILDLIFE VIEWING - Take a guided tour or just set out on your own adventure. Black bears, cougars, elk, wolves, mink, and pine martens. Eagles, ospreys, ravens, hummingbirds, woodpeckers, kingfishers & offshore birds such as puffins and albatross. Whales, dolphins, porpoise, sea lions, seals and otters have all been easily spotted in the Port Renfrew area. Bears, elk, deer, eagle, hummingbird, and mink are often seen around the lodge. 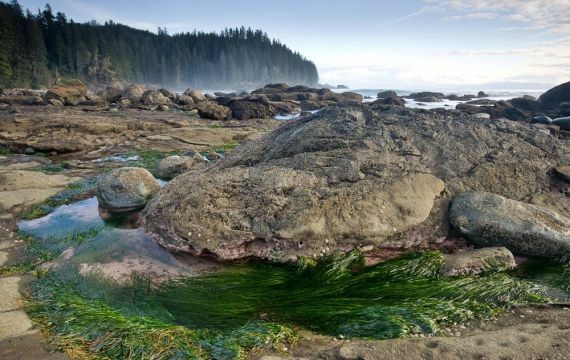 MARINE ECOTOURS - Explore the mystical shoreline of the famous West Coast Trail. Every expedition is an adventure into the pristine beauty of B.C. 's west coast. The rugged shoreline, draped in old growth forests, is the final resting place for over 137 sailing ships and their crews. Sea lions, dolphins and a grand slam of whales; orcas, grays, and the ever playful humpbacks are all commonly sighted. KAYAK AND CANOE - Paddle the sheltered waters of the San Juan and Gordon River or Sea Kayak the outside waters of Port Renfrew. Another world awaits! Tranquil tree lined rivers and inter tidal wetlands to coastal old growth along the ocean. Currently, guided Kayak tours are available in Port Renfrew on the weekends through Trailhead Resorts (250-647-5468); advance booking is recommended. SURFING - A little known secret at the mouth of the Gordon river right in the San Juan Bay in Port Renfrew. Sombrio Beach, and of course Jordan River, are home to some of the best surfing conditions on the Island, especially in the fall/winter. BIRDING - Chickadees, Wren, Pipers and Jay greet you inland, while on shore the tide is out and several species of Gulls, Terns and Killdeer rest on exposed gravel bars. Mergansers fish along the far shore, while a flock of Brant Geese lift off. A Bald Eagle circles overhead, while Starling flitter back and forth. Paradise! Our most prized sighting is likely the Pigmy Owl. MOUNTAIN BIKING - Hundreds of miles of old logging roads, some dating back a hundred years, make Port Renfrew ideal to visit points of interest no longer accessible by car and too far to walk. A RICH HISTORY - awaits those who journey to Port Renfrew; from the resident First Nations Band of the Pacheedaht to the "discovery" of the area by the infamous Captain Cook, on through to gold rushes, 137 ship wreck sites, and the turn of the century mining, fishing and logging. Awesome hiking, mountain biking, canoeing, and kayaking are easily accessible. Bring your own equipment, or rentals can be picked up in Sooke.